Obama hasn’t a clue what he’s doing, but at least he isn’t George W. Bush. The Iraq War lies now mostly in the realm of myth. We have forgotten exactly how we got both into and out of the war. The October 2002 joint congressional authorization to go to war was not just about fears of weapons of mass destruction (WMD). Other worries prompted broad bipartisan support for the resolution. A majority of Democratic senators (as evidenced by their passionate speeches from the Senate floor) cited many of the resolution’s 23 writs. The latter were mostly concerned with things other than WMD: harboring terrorists, offering bounties for suicide bombers, giving refuge to at least one of the 1993 World Trade Center bombing suspects, committing genocide, attempting to kill a former U.S. president, and so on. Hillary Clinton should watch her own 2002 speech from the Senate floor. Iraq admitted, among other things, an offensive biological warfare capability, notably, 5,000 gallons of botulin, which causes botulism; 2,000 gallons of anthrax; 25 biological-filled Scud warheads; and 157 aerial bombs. And I might say UNSCOM inspectors believe that Iraq has actually greatly understated its production. Over the past few months, as [the weapons inspectors] have come closer and closer to rooting out Iraq’s remaining nuclear capacity, Saddam has undertaken yet another gambit to thwart their ambitions by imposing debilitating conditions on the inspectors and declaring key sites which have still not been inspected off limits. . . . It is obvious that there is an attempt here, based on the whole history of this operation since 1991, to protect whatever remains of his capacity to produce weapons of mass destruction, the missiles to deliver them, and the feed stocks necessary to produce them. The UNSCOM inspectors believe that Iraq still has stockpiles of chemical and biological munitions, a small force of Scud-type missiles, and the capacity to restart quickly its production program and build many, many more weapons. . . .
Now, let’s imagine the future. What if he fails to comply and we fail to act, or we take some ambiguous third route, which gives him yet more opportunities to develop this program of weapons of mass destruction and continue to press for the release of the sanctions and continue to ignore the solemn commitments that he made? Well, he will conclude that the international community has lost its will. He will then conclude that he can go right on and do more to rebuild an arsenal of devastating destruction. And some day, some way, I guarantee you he’ll use the arsenal. . . . The Iraq Liberation Act, and the bipartisan support for it, later set the stage in a post-9/11 climate to authorize the use of force for regime change and to establish a democratic alternative. Note here: Bush went to war with the full support of the American people (polls showed majorities of over 60 percent in favor), with bipartisan authorization by Congress, after a lengthy but unsuccessful attempt to gain U.N. approval, and following the earlier prompts of Bill Clinton’s warnings about WMD, which were confirmed by then-current intelligence assessments available to Congress and unquestioned at that time by any in Congress who perused them. The anger that developed in the U.S. over the Iraq War did not originate from the stated aim of removing the monstrous Saddam Hussein or even the subsequent absence of large stocks of deployable WMD within Iraq. Saddam, remember, had killed perhaps a thousand times more Iraqis, Kurds, and Iranians with WMD than has Bashar Assad (and apparent stocks of WMD mysteriously have a bad habit of still showing up in Syria and Iraq). Instead, the war became unpopular largely for two reasons. 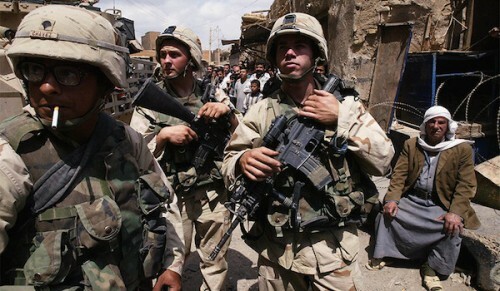 By late summer 2003, insurgents and terrorists had begun killing Americans in large numbers. After the American public had been prepped by an easy victory and relatively light casualties in the initial invasion, and the apparent end of the war with the successful dethronement of Saddam Hussein, the unexpected violence came as a shock. Had the U.S. military lost 4,000 dead in removing Saddam — as some retired generals had warned before the war started — and imposed immediately a quiet peace, the public would not have turned against the war. It was the depressing notion that such a brilliant campaign was followed by a costly occupation that prompted grassroots anger. Second, the Bush administration had ignored many of the emphases of the original congressional writs and instead hyped the fears of WMD. When the latter were not found in large deployable stocks, and the war had come to seem too costly, a number of the original supporters of the war — like Senators Joe Biden, Hillary Clinton, John Kerry, Harry Reid, and Jay Rockefeller — flipped and condemned not just the conduct of the war, but the circumstances under which they themselves had advocated it. No one in the media asked any of these new critics whether the Kurds had never been gassed, or Saddam had not harbored global terrorists, or the Marsh Arabs had not been destroyed, or Saddam had not tried to kill former President George H. W. Bush. The media — and not just the mainstream media — likewise turned on the effort. Once-vigorous supporters across the political spectrum, such as William F. Buckley Jr., Thomas Friedman, Francis Fukuyama, George Will, and Fareed Zakaria, now damned the war as either ill-thought-out or incompetently run to the point that its aims were not worth the costs of the means to achieve them. If the failure to bring democratic reform to the Middle East had once been the liberal critique of George H. W. Bush’s short-sighted peace deal with Saddam Hussein, advocacy of constitutional government now became the brand of supposedly suspect neo-con pro-Israel operatives. The incompetent occupation from 2003 to 2006, coupled with the U.S. elections of 2004 and 2006, sparked an anti-war movement in which the likes of Michael Moore, Cindy Sheehan, the Democratic Left, and the New York Times — mostly now silent amid Obama’s current bombing — made claims that Bush alone had started a preemptive unilateral war for the sake of oil. That he was following prior Clinton leads, had congressional authority on the basis of more than 20 writs, believed that Saddam was a supporter of global terrorists, and was already ensuring that Iraqi oil would go to market under transparent circumstances and mostly to China, Russia, and Europe — all these were conveniently ignored. After a disastrous midterm election, and without much support among his Republican base, Bush in late 2006 gambled with the surge, and appointed General David Petraeus to pacify Iraq and win the peace. Two years later the surge was recognized even by its critics (with the exception of Barack Obama) ​as a success. Obama entered office with a relatively calm Iraq and with the monthly accident rate among the U.S military higher than the numbers of troops injured or killed by enemy action in Iraq. In other words, as in the bungled and far deadlier Korean War, a peace was finally won, and an occupation was outlined that could ensure Iraq a pathway to stability. Whether that result was worth the horrific cost in terms of the dead, the wounded, and lost treasure can be debated. But what cannot be questioned is that Iraq in 2009–11 was far more stable than many other Arab countries, such as Libya, Egypt, or Syria. It had escaped most of the violence of the Arab Spring, and thus was hailed by Barack Obama and Joe Biden variously as stable, secure, and potentially the Obama administration’s greatest achievement. What happened subsequent to 2008 is also a matter of record. Obama had run for president on the promise of getting all troops out of Iraq and on the premise that the surge had failed. He pulled the last U.S. peacekeepers out in 2011, and yet bragged in the 2012 campaign about the stable government that he had left behind — something that would be analogous to having yanked all peacekeepers out of South Korea in 1955, or Japan in 1950, or the Balkans in 2002, and then assuming these war-torn countries would have followed their actual mostly successful trajectories. Once we left Iraq in 2011 — having announced that we were going to do so as early as 2009 — the once defeated and dispersed radical Islamic terrorists regrouped under the banner of the Islamic State. The Maliki government, no longer fearing U.S. oversight, hounded its Sunni enemies. Corruption spread. Iran entered the strategic vacuum. Our Sunni friends in and outside of Iraq felt abandoned. And by 2014 Iraq had regressed to 2006, with the country in open civil war. In response to this chaos, Barack Obama has bombed Iraq without congressional support or U.N. authorization, but apparently relying on the very 2002 congressional resolution he once caricatured. He is now bombing Syria without any resolution from Congress or authorization from the U.N. He has not been able to square the circle of his own conduct, namely that his politically driven decision to leave Iraq may well have created the very conditions that led him to choose to get back into it. Note too the absence of an anti-war movement in America today. There is no grassroots outrage that Obama did not seek resolutions from the U.N. (as opposed to merely lecturing to it). No one is angry that he bypassed Congress the way he did in bombing Libya. There is no stated worry about indiscriminate bombing or collateral damage. Instead, in the same manner in which renditions, Guantanamo, preventive detention, the Patriot Act, drones, and almost all the other Bush–Cheney anti-terrorism protocols were once proof of the Bush administration’s supposed criminality, only to be conveniently ignored when Barack Obama embraced them, now the new bombing of Iraq and Syria is likewise not a source of popular discontent. That Obama has now bombed three Arab countries and done nothing to help ameliorate the chaos on the ground may be politically astute, but it is not a morally driven decision. Bush, the supposed war criminal, sacrificed his presidency to ensure that American bombing did not lead to a Mogadishu-like situation in Iraq. He ordered the surge, after warning what would happen if he did not — and what did, in fact, happen under Obama. Concise, understandable, devastating indictment of O and his administration’s foreign policy. I truly wish we had the clarity, frankness and moral strength to once again seize leadership of the free world. Evil is winning right now. It’s so obvious to anyone who opens their mind. In an age of instant disemination of information and tech advances hurtling at an unprecendented pace we are back in the 8th Century of enlightenment. The World needs US more than ever and yet we have become Orwell’s Animal Farm incapable of even helping ourselves paralyzed by pc and language. Good article, but I think you are missing something about Obama. He is not stupid, incompetent, naive, or any of that. He is capable of seeing the results of his policies, and no doubt capable of weighing the outcomes before he acts. Remember, he is a smart, ruthless campaigner. He won two Presidential elections, and that is no small feat. He knows what he is doing. He is doing this deliberately. His goals are not the same goals you or I would choose for him. His goal is to bring the United States down from her high place in the world. To counter Israel with Iranian power. To move forward the goals of the Ummah. I am not saying he is a Muslim. He is not. He is, no doubt, an Atheist. He knows no other gods before himself. But he has a soft spot in his heart for Islam, and you can see that when he insists that the Islamic State is not Islamic. How much of the is just rhetoric, I do not know. I think he sees the results of his policies, though, and is pleased with his accomplishments. He doesn’t want to be remembered as a Great American President, so much as he wants to see American power and prestige reduced. He knows what he is doing. He is achieving his goals. That is why you won’t see any real change in his policies, no matter how much they may seem to back-fire on him. He doesn’t see it as a back-fire at all. He is an expert 3 card monte dealer. Little if anything more. jftr…those are army troops, not Marines. A fair article… doesn’t give Bush a pass either. But regarding the last paragraph and last sentence about Obama: “… he so far has not lost American lives in the process — at least until the ascendant Islamic State flexes its global muscles.” I guess this doesn’t count the many “workplace violence” deaths in the US over the last few years, including the recent beheading in Oklahoma! The issue for Obama is that everything is of an equivalence. Everything is everything and the point of that is strictly domestic politics. It could be Iraq or Syria. It could be climate change. It could be the price of tomatoes. It could Ebola or animal rights or volcanoes of domestic violence or Ferguson or just about anything that he can get on TV to pretend-rail about and then shake his fist that somebody somewhere is stopping him personally from solving it. But the goal, the only goal, clearly is domestic media driven politics: tomorrow’s poll, next month’s election, Sunday’s sound byte. And that’s it. Because he’s an empty suit, a campaign machine. That’s what he does. And what better way to campaign when you can synthesize your own issues to campaign on? Everything O says an/or does is consistent with a hidden agenda of promoting Islam and weakening the West. Starting as a teen ager and continuing today, there is nothing said or done which does not advance the Muslim. Is it an unconscious bias or deliberate is not easy to determine, but find one statement, one action which in anything which gets in the way of eventual Muslim dominance. Thank you for this brilliantly illuminating trip down memory lane. I have bookmarked this article as a concise reminder of the reasons we went to war with Iraq. Your exposition of the dramatic differences in war policies of our two most recent presidents is devastatingly accurate. Wonderful! I said it 10 years ago, and it should be said again: George W. Bush is the only American president to adopt a practical war policy since WWII and the only president with a successful approach to the mess that is the Arab Middle East. The war that succeeds is the one that maintains an occupational force for many years after the initial defeat–perhaps even a decade or so–and oversees the transition to a secular (not religious) democratic republic with a constitution modeled after our own. If that is not our goal, we should not be waging war. President Bush’s iron-willed resolve to bring democracy to Iraq and name the Axis of Evil emboldened the freedom-loving youth of Lebanon to cast off the shackles of Bashar al-Assad’s oppressive Syrian presence in Lebanon. The moderates in the Arab World look to a strong America that does not tolerate fascist leaders like the Assads, Saddam Hussein, and the Islamic government in Iran. I have no doubt that a vibrant democracy taking hold in Iraq would have led to democratic revolutions in other Arab countries. Rob Johnson, you incorrectly mistake Obama’s ineptitude at governing for some kind of purposeful attempt to bring America low in the world. He is indeed an articulate and intelligent man but that has almost no relationship to skill at leading and governing. He has a different view from conservatives of America’s place in leading the free world but that doesn’t mean he’s actively trying to undermine it. Ineptitude can be just as damaging as a concerted effort to undermine our traditional leadership role in the world. That Obama can run a successful election campaign (with a lot of help from the Democrat party electoral machine) but be a feckless leader should come as no surprise. He had no executive experience before he became president. None. He’s a bright man but a lousy leader. I meant to say “the war that succeeds IN ACHIEVING A LASTING PEACE is the one that soundly defeats the enemy and maintains an occupational force for many years after the initial defeat to oversee a transition to a secular (not religious) democratic republic with a constitution modeled after our own.” Going to war is the worst decision except when all the other ones have failed to achieve a lasting peace. The incredible shrinking memory of the Democrats cited in this article would cause me to leave public service before my lapses could cause severe damage to the people I say I’m serving. Of course, in real life nothing of that sort is likely to happen. The blood of the dead and wounded are the real treasure that was spent in acquiring control over Iraq. The incredible short sightedness of the Obama Administration in failing to secure the SoF agreement with the equally short sighted, nay stupid Maliki government will come back to haunt us. I pray that historians will simply tell it like it happened. If an enemy signs a cease fire agreement and then shoots at your planes hundreds of times, doesn’t that mean that a state of war exists? I never understood the need for the WMD argument. You are far too easy on the cynicism and immorality of the Democrat Party. They voted for the invasion with enthusiasm but when the first bad news came in, they played on the fears of the American public in an utterly demagogic fashion. Their goal was not achieving American foreign policy objectives and making the Middle East a less dangerous place for American interests but in achieving electoral victory by any means possible. Others like Buckley were just too weak minded to stand against the stampede of public opinion generated by the Democratic Party. Excellent digest on the Iraq situation as it stands today – thank you Mr. Hanson for your painstaking attention to details! While Congressional people have given many different rationalizations for why America should go to was with Saddam’s Iraq – I still did not buy it, since they did not perform the legal act of declaring war as prescribed by our U.S. Constitution. The acid test for me is simple, if congressional rationalizations are good enough for a resolution of war, why is it that they are not good enough to follow the U.S. Constitution and declare war officially. To me this is suspect. However, once we engaged in a war with Iraq, I proceeded to support it since I believe that when you commit to something you need to complete it! Unfortunately, I am afraid; I don’t think the intellectual nitwit in the White House knows the meaning of successfully completing a commitment once it is in force. Hopefully he can prove me wrong, since this would be the best outcome for our country. I totally agreed with one of the commentators assessment of the Democratic party and liberals in particular, their main thrust as an organization is achieving electoral victory by any means possible – the hell with everything else (morality, spirituality, legality, etc.) ! The biblical pronouncement of people who don’t have the ability to make sound judgment and don’t care about the moral, spiritual and legal ramifications are people who minds has been seared with a hot iron (Romans 1:16 and following), definitely the ungodly ultra-liberals and their supporters are well entrenched in this mind set. Perhaps the next election won’t be won by a smooth talking Ivy league educated minority political hack of limited real world experience and leadership who played to and received a winning vote combination of racism, white guilt, and hopes of quelling future tensions by a historical first. It is a failure just like the past background checks. There were and will be better possibilities in any color one desires. Why isn’t this truth being shouted from every media outlet in the world? This is absolutely insane. All the suffering of our troops and so much of our treasure wasted. It is unbelievable that an American President can make such a horrific decision and still be in office. I greatly enjoy all of your articles. Regarding the 2003 Iraq War, please write a follow-up article that quotes in full the 23 writs that Congress approved in October 2002. The Left is constantly repeating that there was no justification or it was just WMD when, as you have pointed out, there were several reasons. Many of us on the conservative side need to see in print these 23 reasons with a translation or analysis of the lawyer-speak that accompanies each writ. Most importantly, how does each writ stand up to scrutiny in hindsight? Thank you very much, Theophilus, for this excellent collation of source material. Some I had seen before and some links were new to me. While the source material is greatly appreciated, I am still requesting that Professor VDH conducts a systematic interpretation of each of the 23 writs, especially in regard to how they stand up in hindsight, 12 years since the October 2002 authorization. Thank you, Theophilus. I had already discovered some of the links while others were new to me. In any event, Prof VDH could provide a service to all of us by taking the source material and providing a systematic review of the 23 writs.